We suggest using another Chrome profile. 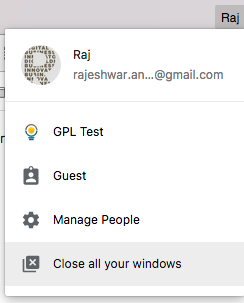 When using a Mac, double check inside the Chrome browser, the login section exists on the top right. - Simply click on "Manage People" and create a new profile. - Once you are logged in, where you usually find extensions, simply right-click (you'll see an icon) and it will present you with a setting that allows you to install extensions. - Installing GoPinLeads there will allow you to log in with another Gmail account.